Let’s talk about ereaders. And first, let’s talk about Kindles. I got my first Kindle in April 2009. Almost exactly 10 years ago. Goddaaaaamn, time flies. I didn’t buy into the whole Kindle hype at first. But I decided to try out the Kindle 2, skeptically. And I was hooked. I wound up buying several Kindles over the years, upgrading not at every new version, but every 2-3 years. I got the PaperWhite 4 late last year – as soon as it was available for preorder. And I loved it. Then I started thinking about getting the Oasis 2, mainly for the screen size. Most Kindles have stuck with the 6″ screen, whereas the Oasis went up to 7″. But the Oasis 2 is already pretty old, so I was waiting to see what might come out later this year. They both make several different models. E-ink, a lot of large screen sizes, and, most interestingly, with a stylus for sketching or taking notes. They also run a version of Android, which means you can install additional apps on them. Oh, and yeah, they are $$$$$. Way more than Kindles in general. This has a 7.8″ display, larger than the Kindle Oasis, which is one of the first things I was looking for. The screen is beautiful, high dpi, front lit with two colors of LEDs which you can control independently or sync them for a neutral light. 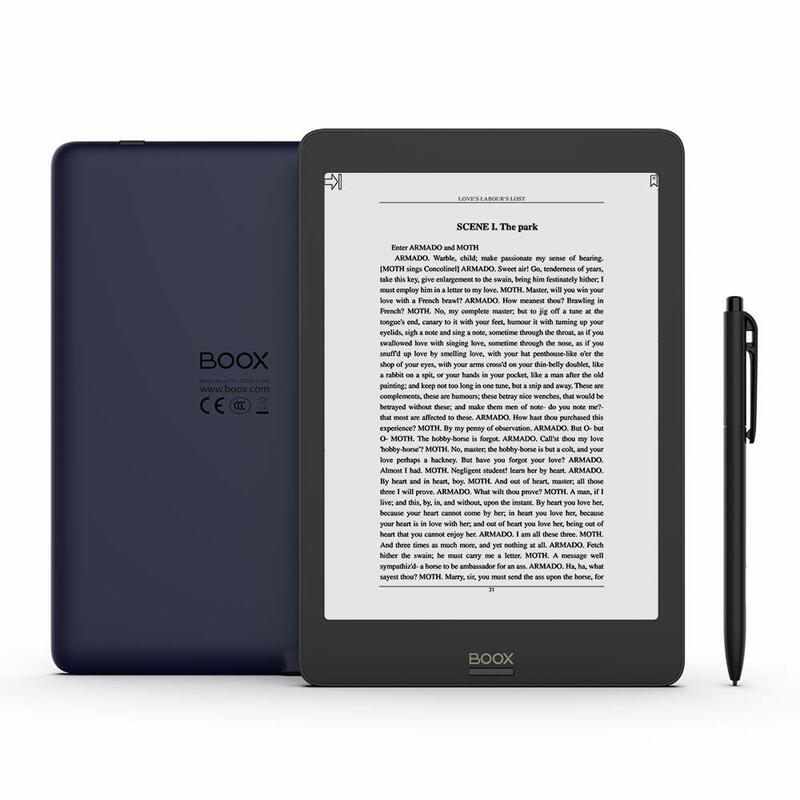 It has a built-in ebook reader which supports a ton of file formats: PDF, ePub, MOBI, Doc, Docx, Docm, TXT, DjVu, FB2, HTML, CHM, AZW, AZW3, FBZ, ODT,PRC, RTF, SXW, TRC , JPG, PNG, BMP, TIFF, CBR, CBZ. Compare that to the Kindle, which supports AZW3, AZW, TXT, PDF, MOBI, PRC. Anything else has to be converted to one of those formats. Your reading experience can be customized to an amazing degree. Seriously, after two weeks, I’m still learning what you can do. Fonts, light temperature, boldness of text, text encoding, indentation, columns, text direction, text contrast, image contrast, line spacing, paragraph spacing, vertical margins, horizontal margins. The Kindle has some of that, but not nearly to the same degree. You can have several books open at once, in tabs. You can do text-to-speech. You can customize what happens when you tap any area of the screen, setting up different actions for each of nine screen zones. It does timed auto page turns and does a grid preview of either one, four, or nine pages at a time, plus table of contents as a sidebar. Rather than the arbitrary Kindle “location” numbers, it always gives you the total pages and current page based on one page being one screenful of text. Of course this changes if you change the font size. And to be honest, it’s a little bit janky. It’s often a page or two off, but in general, it’s a fine estimate and easier to understand then Kindle’s locations. Quick note about PDFs: while the Kindle supports PDFs, the 6″ screen size makes 95% of PDFs completely unreadable. The extra screen real estate on the Nova pretty much handles that. It’s also got a ton of other PDF-specific tools that I haven’t mentioned, that make things a lot easier, such as auto-cropping of margins to make reading PDFs even better. For PDFs, you can use the stylus to draw or write directly on the PDF. For other formats, you can choose the side note feature, which opens the doc in split-screen landscape mode, one side for the book, one side for you to scribble on. It has built-in dictionaries and you can add others and switch between them easily. Unlimited highlighting and notes, with different types of highlighting and underlining. I could go on. It’s overwhelming. But overall, it’s just a great reading experience as well. The screen size and resolution, lighting, all the formatting options and navigation just make it a joy to read books on. The other main thing that made me buy this was the stylus. Or in reality, the Wacom drawing layer that lets you draw on the screen with the stylus. I already mentioned being able to draw on PDFs. But more useful for me is the built-in notes app. Again, crazy options: fixed width pencil mode, or pressure-sensitive brush mode, a few simple shapes, erase entire lines or just portions, lasso tool – select, scale, rotate, move drawings, add text, OCR what you’ve written, choose line width and color (black, white, red, green blue – colors show up on exported PDFs). It comes with a bunch of templates – grids and lines of all shapes and sizes, calendars, todo lists, etc. Back up to Dropbox, OneNote or some other services. Each note can have multiple pages and you can organize notes into folders. Notes are natively saved as PDF files, but you can also export them as PNGs. Again, I could go on about this feature forever. I really like it. Things you won’t find, though, are things like zooming in and out or layers. It’s not a serious art tool, more for handwritten notes and quick sketches. To be honest, this aspect of the tablet I could have done without. But now that I have it, there are a few cool aspects. Although it has a built-in app store with a few staple apps, you can also add the Google Play Store and download anything that will work on Android 6. Really the only things I’ve found particularly useful are Pocket, Instapaper and Dropbox. I mean, it comes with an email client, but you can also add Gmail. It has a full featured browser. You can install Youtube! And games. Yes, videos and animation in e-ink. It works and it fun to try out, but seriously… no. I have way to many other devices to hand that just do all those things much better. You can also do audiobooks and play music via Bluetooth headphones or speaker. But again. I have other devices. Oddly, you can also install other ereader apps, including the Kindle Android app, Nook, Google Play Books, etc. Personally, I use Calibre to manage my ebook library and put it directly on the device anyway. More on that next. I use Calibre to manage my ebooks. It handles just about any known format of ebook and does a good job of converting between formats. It has a plugin system and a rich ecosystem of plugins that deal with all kinds of things. One I use often is a metadata plugin that searches the internet for metadata and cover images for any book that is missing those. I also use a DeDRM plugin so when I download my ebooks from Amazon, it strips the DRM from them and lets me read them anywhere, including the Nova. Is this legal? Probably not. Is it ethical? I feel like it is. I’m not uploading my books to sharing sites, or otherwise making them available to others. I buy books for my personal use, and I use them personally. But I want to have backup copies and want to read them on devices and apps that are not made by Amazon. Another great thing is that when I connect the Nova to my computer with USB, Calibre recognizes it. I can then select whichever books I want and just say “Send to device” and they instantly appear there. The Nova has 32 GB of storage, which is huge if you are just storing books there. Audiobooks, music, and manga will take up a lot more space, but that’s as much as the best Kindle has. In the reading app you can view your whole library, filtered and sorted by various criteria, or toggle over to just recently active books, which is what I mostly use. You can also sort books into folders. If you just want to shoot a single document over and you don’t have a USB cable to hand, the Nova has a wifi transfer mode. This launches a local server at an address something like 10.0.0.125:8083. You go there on your computer and you get a web page that allows you to select a file and then sends it over to the device. I use this often. The Dropbox app is also super useful for accessing content on the device. And as mentioned before, I use the Pocket and Instapaper apps to save web articles and read them later on the Nova. It’s a pretty good experience. The system also includes a simple but totally functional file manager that lets you move files around, rename, delete, create folders, all the usual stuff. As I’ve been saying, the number of options on this thing is overwhelming and I’m still learning all that is possible. The UI is not nearly as slick as the Kindle. In fact, it is very much a UI that some enthusiastic developers put together. In addition, all the software is created in China, and it’s created in Chinese. You can set the language to be English and you’ll be fine, but you will see some strange grammar here and there in the UI, and the occasional misspelling. The good news is that the firmware is under very active development. In fact, shortly after I got my Nova, they announced version 2.1 of the firmware. I was able to update easily and it brought a ton of improvements. On the plus side, the system has been rock solid. It’s never once crashed or frozen up or done anything weird at all in the couple of weeks I’ve had it. The Kindle advertises six weeks of battery life. When you drill in on that, that’s with no Bluetooth or wifi and 30 minutes of reading per day. Even then, I’d say that’s optimistic. In real life, you’ll probably get at least a couple of weeks on a Kindle charge though. The Nova is a different story. It’s an Android device. But, that said, it’s pretty good at conserving power. I’ve gone a full weekend with a lot of reading and use and still wound up at 60-something percent. During the week, with a bit less use, I made it through four days and was down to 30-40% I think. So you’re talking days, not weeks. I’ve got a big USB charger next to my bed, so it’s easy enough to just plug it in before I go to sleep. A Kindle just sleeps and when you want to read it just instantly wakes up. The Nova can do the same, but when it’s sleeping, it’s going to be using a lot more power than the Kindle would be. So there are two power settings. One will put the device to sleep after so many minutes of inactivity, another will turn it off after a certain time. Options are sleep after 3, 5, 10, 30 minutes or never. And power off after 15, 30, 60 minutes or never. I have these set to sleep after 5 minutes and turn off after an hour. And with that, I get several days off a battery charge. You can disable the power off timer, but that’s going to affect the battery life. I haven’t experimented with that, so I’m not sure what the impact would be. The downside to turning it off is that it takes a little while to boot up. About 35 seconds. A bit of an annoyance, but since it stays on for an hour after your last activity, it’s livable. And obviously if you install a lot of apps that are doing stuff in the background, that’s going to affect battery life. There is a power saver mode, which apparently throttles background app power use. I haven’t tested that much either. Overall, with my current settings, I’m completely satisfied with the battery life at this point. The Onyx Nova Pro costs $299 USD. Plus tax, shipping, whatever. I threw in $40 for a case that does the auto-on/off when you open/close it, and has a holder for the stylus. That’s the same as a 32 GB Kindle Oasis without special offers. But SO many more features. Update: The $299 was what I paid on Amazon, where it is currently not available. It will probably cost a bit more elsewhere. Hopefully Amazon will get some more soon. Second Update: It’s back on Amazon, but currently $319. Note: the first video shows the device running the older firmware, while the second shows the updated 2.1 firmware with many improvements.